Enrished with essential, skin loving minerals and vitamins, these wipes gently sweep away make-up and impurities whilst caring for combination skin. Skin is cleansed, soft and smooth. 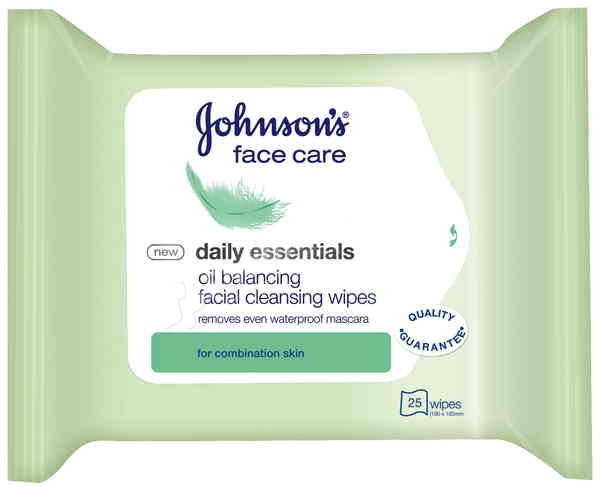 JOHNSON'S Oil Balancing Facial Cleansing Wipes gently wipe away impurities and effectively remove make-up, even waterproof mascara, leaving your skin hydrated and revitalised. Aqua, Cetearyl Isononanoate, Coco-Glucoside, Ceteareth-20, cetearyl Alcohol, phenoxyethanol, Glycerin, Glyceryl Stearate, Polysorbate 20, Cetyl Palmitate, Ceteareth-12, Panthenol, Magnesium Aspartate, Zinc Gluconate, Copper Gluconate, Glyceryl Oleate, Ascorbyl Glucoside, Hydrogenated Palm Glycerides Citrate, Simethicone, Citric Acid, Tetrasodium EDTA, Cetylpyridinium Chloride, Benzoic Acid, Parfum.